Many thanks to those of you who submitted comments and feedback on the initial FamZoo logo concepts. Your responses were extremely helpful. The reason I like this submission best is that it feels very clean and simple (I think it passes the "embroidery test" mentioned in my brother's comment). 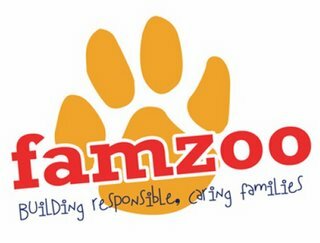 I also feel that depicting "famzoo" in a clean, regular font that is stamped over an irregular, wild paw print does a good job of capturing the mission of FamZoo (as described here) - i.e., overlaying some semblance of order and responsbility on our hectic and occasionally "wild" family lives. Refinements (beyond removing the tag line) might include trying different color combinations, experimenting with various clean orderly fonts, and perhaps capitalizing the "F" and the "Z" to match the official name of the company (although, lowercase may lend a more regular, balanced look - also it matches what people would type into a browser). All that said, several of you registered concern about the logo concepts placing too much emphasis on the "zoo" vs the "family". Excellent feedback. My wife as well as Jayesh and Malvika (see comment), have suggested incorporating a simple house icon as a clean representation of "family". I like that idea, but I was having a hard time giving up on the paw print (sorry Jer ;-). What do you think? Please leave a comment if you have an opinion. I love the paw/house graphic. It says everything. I never got around submitting an initial comment. But my thinking was that the animals in some of the submissions should be replaced with an SUV, with hands, book bags, and soccer balls dangling from the windows. Clearly this type of logo would not pass the "embroidery" test. But I think that the encompassing "house" concept is a much better way to represent the family angle. The house doesn't give the same chaos/zoo vibe as the careening SUV, but it's clean and effective. I think you are onto something with the paw in house logo. It is simple, and it does speak to the idea of taming the wildness that often takes over our homes. I am pleased that no one suggested having a family out on a hunting spree to fully tame the wild beast. Anyway, I agree that color is important, and I like the company name below the house rather than to the right because it is more space efficient that way. Well done maestro! Big paw works well because you can tell it's a paw. :) Also I like the colors, leaves your options open.